The Environmental Protection Agency (EPA) is facing opposition from minority groups as it prepares to finalize costly new ozone regulations, according to a recent article in Politico. Black elected leaders at both state and local levels have come together to push back against the new ozone rule, stating it will disproportionately harm poor and minority communities and manufacturing centers. The new regulation, which EPA will finalize by Oct. 1, seeks to cut ground-level ozone from the current level of 75 parts per billion (ppb) to between 65 ppb and 70 ppb. However, state and local officials have recently said they are still struggling to comply with the current 75 ppb standard and that the new rule will make compliance even more difficult. As explained below, this poses an especially big threat to poor and minority communities that are disproportionately affected by higher energy prices and economic downturns. President Obama’s ozone regulation is designed to improve public health by reducing air pollution that contributes to respiratory illnesses such as asthma. 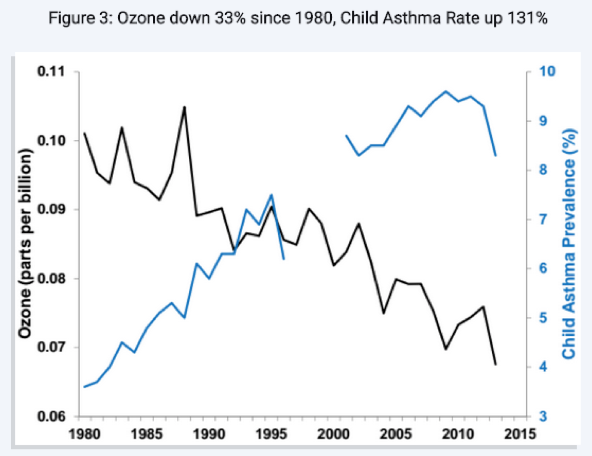 However, as we have documented before, asthma rates are rising even as ozone emissions are falling. This casts doubt on Obama’s claim that further ozone restrictions will do anything to improve public health. To make matters worse, in designing the rule, EPA ignored the link between health and wealth. In short, when you make people poorer, they tend to become sicker. Therefore, Obama’s new ozone rule, which could be the costliest regulation ever, may actually harm public health—especially in poorer communities. To comply with EPA’s mandate, cities have considered a number of expensive new penalties on drivers, including taxes on parking spaces, tolls that get more expensive during peak congestion time, and higher insurance rates for car owners who travel more miles. If you have an older car, own multiple vehicles, or put a lot of miles on your car every year, you may pay higher vehicle registration fees. If these new penalties become a reality, Obama’s ozone regulation will amount to a regressive tax on the poor and minorities. The burden of complying with Obama’s new rule will fall disproportionately on families that can least afford to pay more taxes and fees. Obama’s new ozone regulation will harm low-income and minority families, but fortunately local minority leaders are speaking up on behalf of their communities. The new regulation will harm economic growth, increasing unemployment and poverty across the country, but especially in vulnerable communities still struggling to recover from the Obama economy. Instead of further tightening ozone levels at high cost and for dubious benefits, EPA should keep the existing standard.